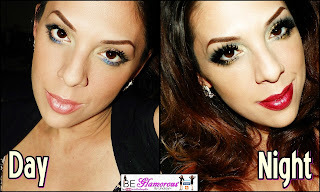 Today I am sharing with you 2 makeup look ideas to use for day to night makeup. Start by placing Honey all over the lid. Apply Down&Dirty to the lid and blend into the crease. Apply Navy to the lower lashline. Apply the Gold Twinkle Dust over all the shadows. Apply the Color Rich lipstick Candy Baby to the lips. Apply Glamazon Sugar Babies lip glaze over the lipstick. Start by applying Navy to the crease blending upwards. Apply Gold Digger glitter to the center of the lower lashline. Apply Sinful Sugar Babies lip glaze right over the day lip. That was a fun and quick transformation from day to night! Well, whether it's a double glazing glass or a triple glazing; to me home insulation is really important now. So I am looking for everest double glazing prices & deals.